No, it's not Lego FTL, it's a new Lego Cuusoo project that aims to turn FTL ships into real, live plastic blocks. First up, a crash course in Lego Cuusoo: It's a site where Lego fans can turn their ideas into Lego concepts and then put them up for public voting. Any idea that earns 10,000 supporters will be reviewed by Lego on a quarterly basis, and those that pass muster will be turned into actual Lego products, with creators earning one percent of its total net sales. Think of it as a Greenlight for Lego; Lego Minecraft came to fruition thanks to a Cuusoo campaign and Portal 2 is now in the review stage. And now up for your consideration is FTL: Faster Than Light, the indie hit about managing a starship through the dangerous blackness of space that earned "Five Faves" spots from Paul, Justin and Critical Miss. The project was created by Cuusoo user "CrashSanders," who began with a design for the Kestrel, the game's opening ship, and then added an Engi Stealth Cruiser, a Mantis cruiser and minifigs of Humans, a Slug, Rock, Mantos and Engi. Despite not coming from "official" FTL channels, the Cuusoo initiative has the support of the developers. "Justin Ma wanted to make a few real Kestrels copies by himself, but I told both Justin and Matthew that we could try to make a Cuusoo project so The Kestrel will have a chance to be officially released as a set," he wrote. "It will bring more FTL fans to Lego and vice versa. And they agreed, allowing me to make a project and promised some community support." Sanders also noted that he was aided in the creation of the ships by Cuusoo user GlenBricker, who provided renders, custom decals and the Mantis species model. Sanders said that notching up 10,000 supporters should be a fairly simple task given the game's "expansive fan base" but added that the faster it happens, the more seriously it will be taken by Lego. 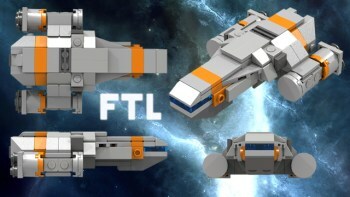 The FTL Lego Cuusoo runs until March 4; you can give it some love at lego.cuusoo.com.